I came home last night to the sad news of the death, at the age of 83, of the actor Peter Falk, most famous for his role as the eponymous Lieutenant in the TV detective series Columbo. The newspapers are rightly filled with tributes today, but it can’t do any harm to add one more of my own. Falk was a fine actor, and I think the character of Lieutenant Columbo was a truly brilliant creation. I’m going to spend this evening watching a few old episodes on DVD. Columbo was remarkable in many ways. For a start it eschewed the conventions of the usual detective story because the audience knows exactly what’s going to happen before it’s even started. Its lack of reliance on the traditional elements of a murder mystery means that you don’t watch Columbo to find out who did it, or whether or not the Lieutenant will ensnare them. We know who did it and that Columbo will catch them out. But how will he do it? Every episode begins with the murderer – nearly always a highly intelligent, highly successful and extremely confident individual, often from the upper echelons of society – carefully planning and executing what looks like the perfect crime – establishing an alibi, removing forensic evidence, and so on. It always seems to work, at least until the shabby character of Columbo shuffles in to inspect the scene. The criminal always underestimates Columbo, at least at first, but in that grubby raincoat hides his nemesis. The lieutenant is a lot smarter than he looks. Sub pallio sordido sapientia. The show’s creators, Richard Levinson and William Link, in fact based the character of Columbo on Petrovitch, the detective in Dostoevsky’s Crime and Punishment. Both men have keen intellects masked by shambolic exteriors, and way the detective drives to distraction, and inevitable capture, a criminal who makes no attempt to run also echoes the great Russian novel. It was an ingenious idea, but it needed a great TV actor to make it work. In Falk’s hands what might have been a clumsy stereotype became a marvellously believable character, sometimes infuriating, sometimes comical, in his own way lovable, and always fascinating. There’s also Columbo’s wrong-footing “false exit”, accompanied by the catchprase “There’s just one more thing…”. Just when the perpetrator has begun to relax, the bloodhound returns. The more trivial the “thing” is, the more damning it proves. As an application of psychology, it’s a superb tactic and it slowly but surely grinds down the criminal’s resistance. Often the murderer’s exasperation at Columbo’s relentless badgering leads to rash actions and errors; the second murder, if there is one, is never as carefully planned as the first. .
It’s hard to put your finger on exactly why this plot format works so well, but it certainly does. Episodes of Columbo are still shown on TV all around the world. As a matter of fact, I watched one on TV in my hotel room in Copenhagen on Thursday night (with Danish subtitles). Part of it is the delight in seeing the humble but decent detective bring down the rich yet evil murderer. But most, I think, is just the excellence of the central performance by Peter Falk. He didn’t do much else of any consequence – an exception is a very amusing self-parody in the spoof detective film Murder by Death – but who cares? As Columbo he was quite superb, and he’s left a woderful legacy. Just time for a quick post today, as I’m off to the airport this afternoon for a short trip (which I’ll no doubt blog about at the weekend when I get back). I’m also late into the office because I had to take my cat Columbo to the vet for his six-monthly check-up. 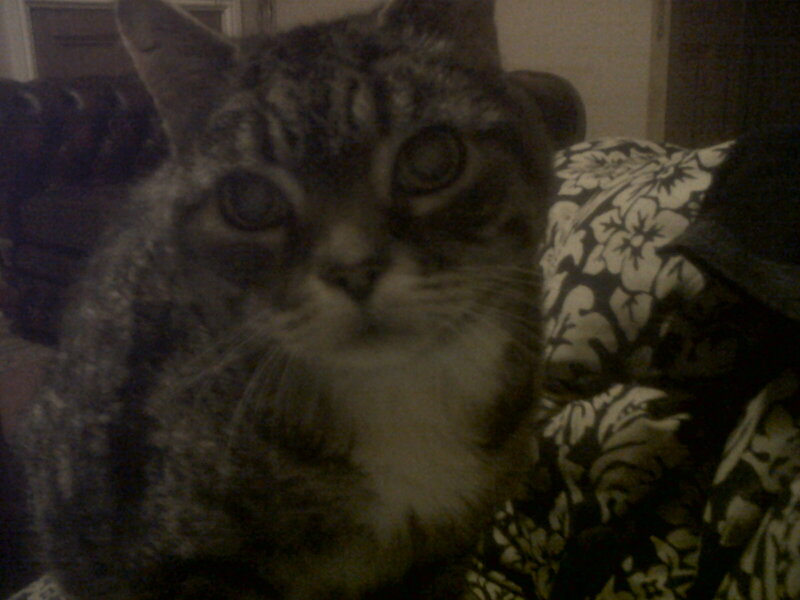 Columbo is now 17 years old (and a few months) and has been diabetic for the last six or seven of those. He needs to have a check-up every 6 months primarily to monitor whether his insulin dose (which is administered twice a day) is adequate to control his blood sugar level. The vet also gives him a general medical, and weighs him, during these visits. This morning Columbo was even more reluctant than usual to get into his box for the trip to the vets. Eventually I got him in, but was apprehensive. Usually when he’s in that sort of mood he retaliates by befouling the box. This time, however, he settled down quite quickly and there were no toiletary disasters en route. The vet’s waiting room was empty when we arrived at 9am so we got seen straight away. The vet was impressed by his age, especially when she saw how long he has been diabetic. 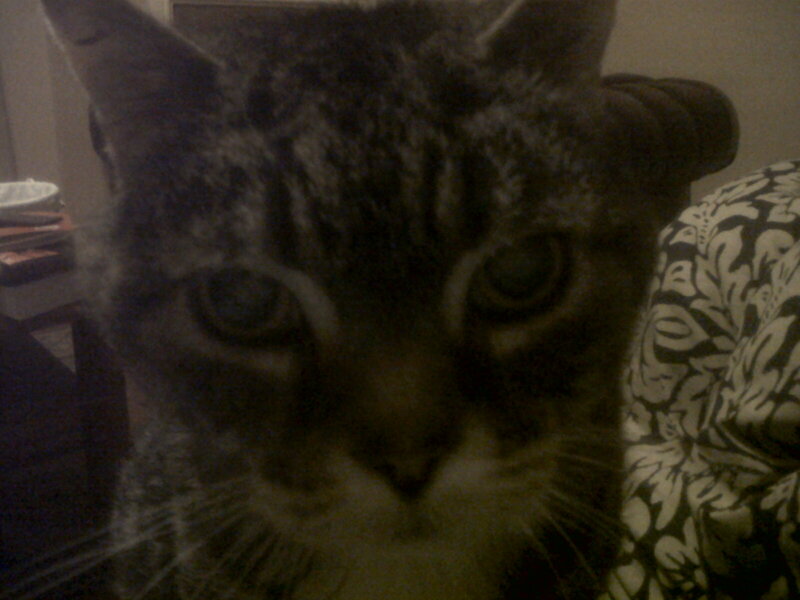 Even without this condition 16 is a pretty good age for a tom cat. Columbo has been through a number of serious medical episodes, at least a couple of which took him near death, but he has always managed to bounce back. He may be an old boy now, but he gets 10/10 for resilience. Looking back over his (substantial) medical history, the vet seems to be amazed by his powers of recovery although history is now definitely taking its toll and he’s looking a bit frail nowadays. The vet noted the effects of the advancing years. His eyesight has clearly dimmed. He’s never been very good at catching birds and mice, but I think he struggles even to see them nowadays. Despite the glucosamine treatment he has been having, his arthritis has also deteriorated. The stiffness in his joints makes it difficult for him to groom himself, so his coat isn’t in great condition even though I brush him regularly. 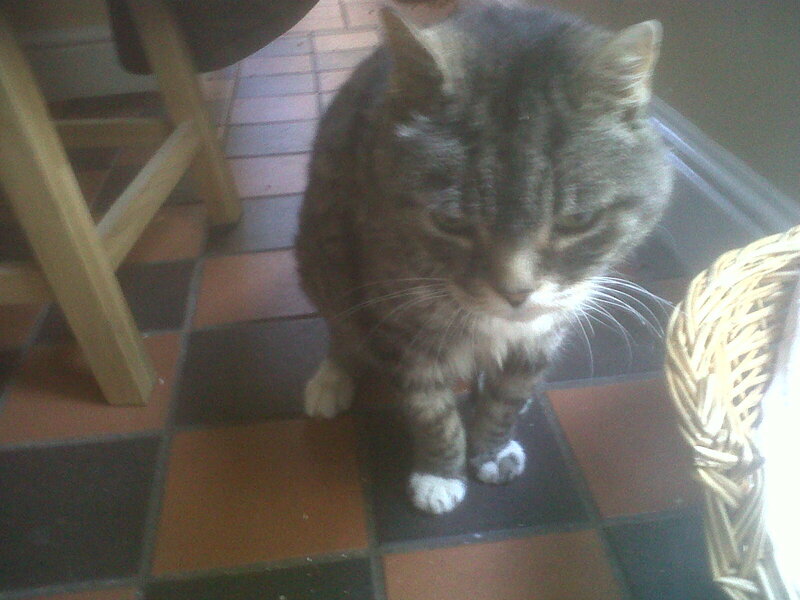 He’s also lost a bit of weight since the last visit; not enough to be life-threatening, but significant nevertheless. On the other hand, his heartbeat and other vital signs seem to be in order, and he purred contentedly on the table during the examination. The vet was a little concerned about his weight loss, but said he clearly wasn’t in any discomfort and trying to prod and probe, take blood samples and whatever to find out the reason was just going to cause him distress. And even if they could fix it, he was still going to be a very old cat if and when he recovered and there’s no cure for old age. During these visits the vet usually takes a blood sample in order to check glucose and fructosamine levels for diagnostic purposes. This time, however, she suggested that it was probably best to skip it. The business of drawing a vial of blood from a cat’s neck is unpleasant and extremely distressing for the animal. Given that his bodily signs were OK, there seemed little point in subjecting him to this. Instead she suggested we just maintain the current insulin level unless and until something appears to go wrong. I agreed. Not doing the blood tests saved me a bit of money, but that’s not the point at all. I know the old boy is much nearer the end of his life than the beginning. I just want his last days to be as comfortable and happy as possible. I don’t see the point of making him uncomfortable to satisfy veterinary curiosity or to prolong his life by a few months. When the time comes, I’d rather he went peacefully. The one thing I did agree on was to try some anti-inflammatory treatment for his arthritis, stuff you squirt on food. If that works it might make it easier for him to get around, and also groom himself. It does have a side-effect with some cats, making them nauseous, so I have to build it up slowly and keep an eye on him in case he gets sick. Anyway, when it was time to go he climbed willingly into his box – the cat-box process is a very different business at the vet compared to what it’s like at home. When we got home he bundled out at high speed and headed straight for his food dish. He still has a healthy appetite, that’s for sure. Here’s a quick picture for his fans, taken just before he went in his basket for a nap. It’s been a while since I last posted an update about my old moggy, Columbo. In truth I’ve been waiting until today to post about him, because today is his birthday. 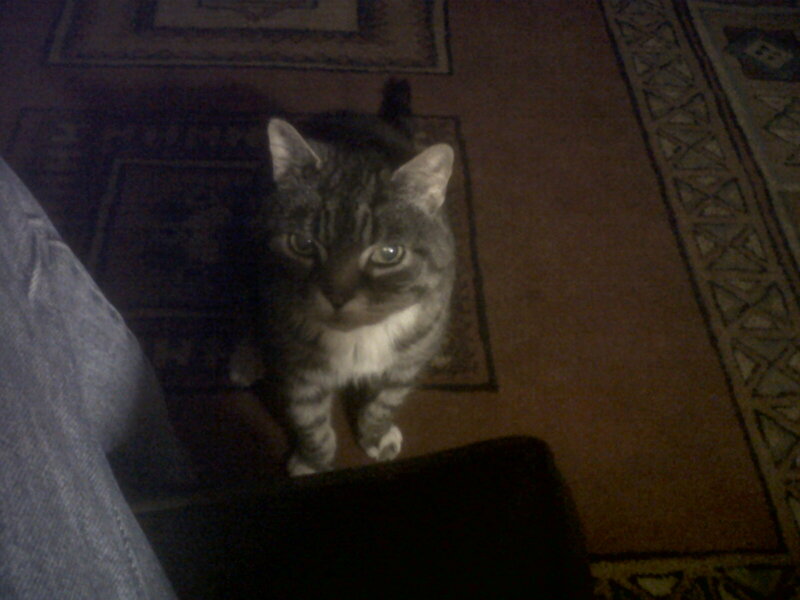 He’s 17, not bad for a diabetic tom cat. Yesterday I bought some fresh prawns and this morning gave them to him as a treat. He demolished them so quickly I doubt if they even touched the sides. Technically he’s supposed to be restricted to special diabetic food but it’s a one-off so I decided to splash out. Anyway, here’s a close up of him looking close up. This is his tactic when there’s cheese on my plate. 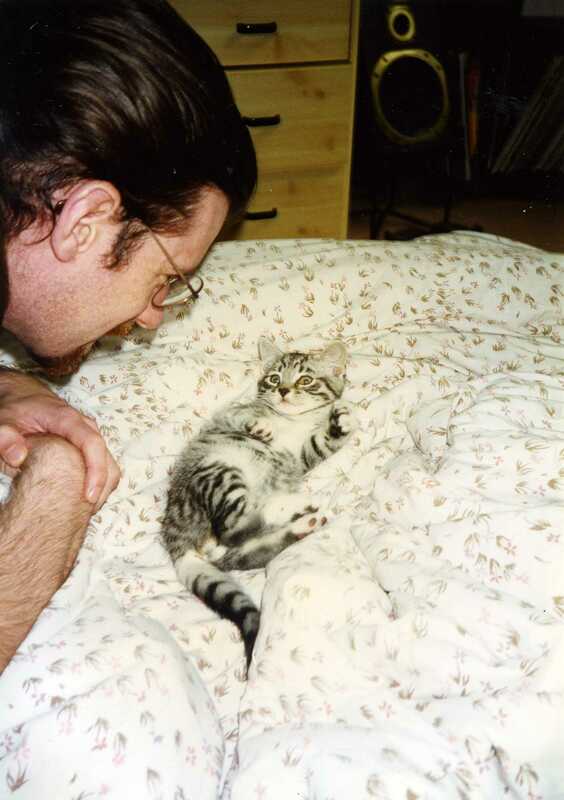 No time for a proper post today, so I thought I’d put up a gratuitously cute picture of my old moggy Columbo, taken when he was a youngster – about 16¾ years ago. Feel free to say “awwww…”. Oh, and the beardy weirdy in the picture is me, also in a younger incarnation. The last two days have been a bit different from usual, owing to the arrival of an unexpected visitor in the Coles residence. About 5am yesterday (Friday) I woke up suddenly to the sound of something moving downstairs. I thought it might be a burglar, so I switched all the lights on and rushed to the landing just in time to see a large rodent running along the hall on the ground floor. I followed it into the sitting room, but it had vanished somehow. Looking around I found a number of tell-tale holes in the skirting boards and floorboards through which the rat might gone to earth, including one hole which has been there since I moved in but which looked suddenly larger. I blocked them all up as best I could and, there being no further sign of my house guest, went back to bad. Columbo didn’t seem to be in the slightest bit bothered by the intruder and, although I put him in the sitting room to act as sentry in case the critter appeared again, within a few minutes he was upstairs sleeping on my bed. I couldn’t get back to sleep, as every little sound I heard made me think of the rat so in the end I got up, had breakfast and got ready to go to work. Thus it was that went into the department bright and early, put a full shift in, and then went along to the Poet’s Corner for a few drinks with the astronomy folks afterwards. This was even more pleasurable than usual because it was an opportunity to celebrate another succesful completion of a PhD; Well done Vanessa! Anyway, I got home quite late and was pretty tired so went to bed hoping that I wouldn’t woken up in the early hours again by the rat. Unfortunately, about 6.30 I was disturbed by the sound of frantic scuttling and gnawing downstairs. This time the rat wasn’t on the surface, but moving about under the floorboards, trying to find an alternative way up. Clearly I’d managed to block the normal route. I made sure everything was secure and tried to get some more sleep, which didn’t work, and eventually when it seemed a decent hour I called a pest control operative who promised to come about mid-day. I busied myself with some domestic chores until he arrived, while periodically checking on the sitting room and whether the rat could still be heard. It could. However, about 11.30, the noise grew louder and finally the creature surfaced again. It had made a completely new hole in only a few hours. Rats must have some gnashers on them. I chased it with a sweeping brush and it holed up under the television. There then followed a standoff, only interrupted by the arrival of the rat catcher about ten minutes later. The guy went for a net – although there isn’t much room to wield such a thing in my house – and we devised a cunning plan to trap it. The plan failed as the rat was much quicker than either of us and its daring escape bid made full use of the element of surprise as it charged straight at us. The rat vanished again under the floorboards, so we had to settle for plan B which was to lay traps and poison anywhere it might get to. Various forms of rodenticide were deployed, including difenacoum and brodificoum. The traps are baited with a mixture of peanut butter and chocolate, both of which I hate, but which apparently rats adore. With that he gave me the bill and left. Columbo slept through the whole adventure, but came downstairs to say goodbye to the rat man. There’s been no more noise from under the floor, but I’m pretty sure the rat is trapped. If it eats any of the poison then it will die there, slowly, and the only way I’ll know about it is when its rotting corpse starts to reek. So I have that to look forward to, unless it hurls itself onto a trap and dies an instant death. The remaining mystery is how the critter got into the house. It clearly wasn’t through a direct route into the front room, otherwise he could have got out the same way and wouldn’t be trapped. Columbo once caught a rat in the garden, but it wasn’t dead when he brought it into the house. The rat catcher suggested he might have done the same thing with this one, and it managed to escape and roam free. Perhaps guilt is the reason Columbo kept such a low profile through all this? That’s enough about the rat. Time to get cracking with my dinner. Followed perhaps by a biscuit.